You’re just in time for a new NetEnt innovation. It’s not the 3D sound or Virtual Reality, yet. But it’s something that has proven to be very popular among players – stacked and sticky symbols. 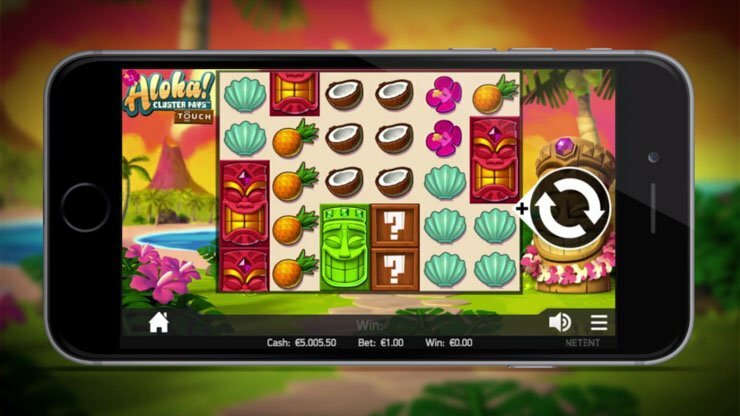 All that happens in the tropical Hawaii, which the Aloha Cluster Pays mobile slot is themed on. 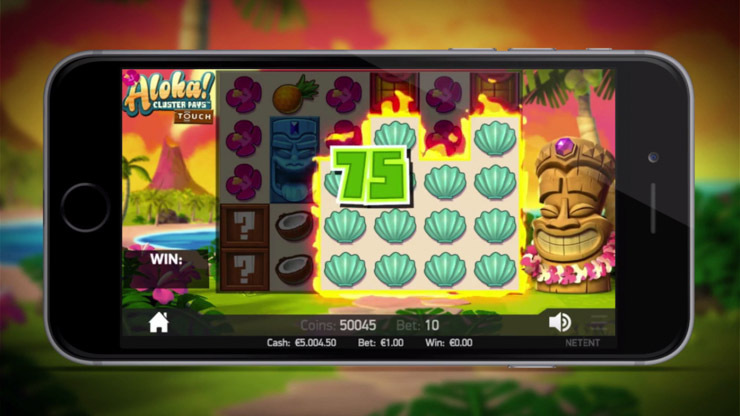 The game was unveiled on 1st February 2016 and was launched soon after the Fantasini and Drive slots, on 22nd March — play the Aloha slot here. 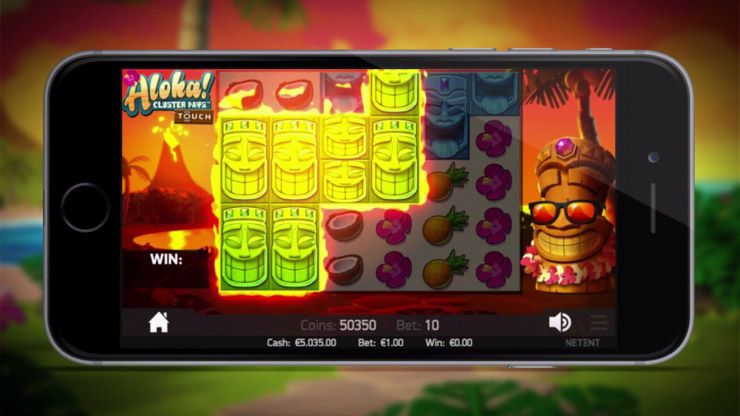 Here are the 6 most important things you should know about the 6-reel and 5-row Aloha slot. 4 out of 6 surprises awaiting you in this new online slot. 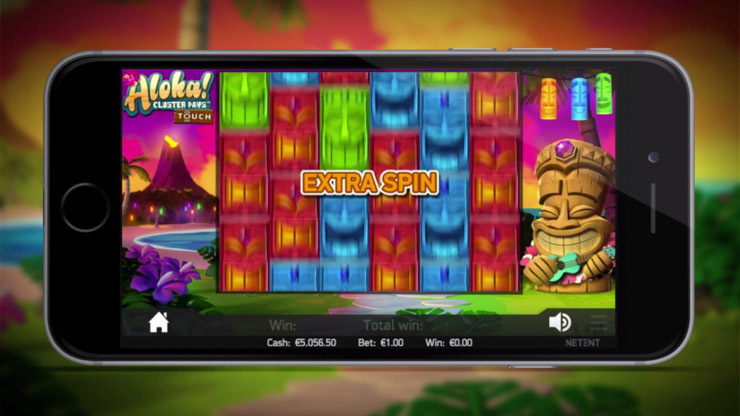 The Aloha slot is the 1st one with the Cluster Pays mechanic. We’ve seen something similar with the Dracula slot. Remember the Bat feature? That formed groups of random symbols? That’s a random feature, but Cluster Pays is switched on all the time. Symbols appear stacked — check. Symbols pay from left to right and right to left — check. Symbols pay both vertically and horizontally — check. 9 or more symbols win — check. That includes low-pay symbols like coconuts, pineapples, hibiscus (Hawaii flowers) and clams. But also the 3 high-pay symbols – tiki statues (wooden totems). By the way, the red, green and blue tiki statue symbols take up 2 symbol positions. That means more chances to win big. Speaking of symbols… Aloha has one special for you too. You need 9 or more symbols to win. The Aloha Wild symbol appears as a box with a question mark on it (Crash Bandicoot anyone?). Wilds in a video slot means even more ways to win. And judging by the Aloha video, the crates substitute all symbols, including tiki statues. Not only that, but Wilds also appear stacked across all 6 reels and 5 rows. 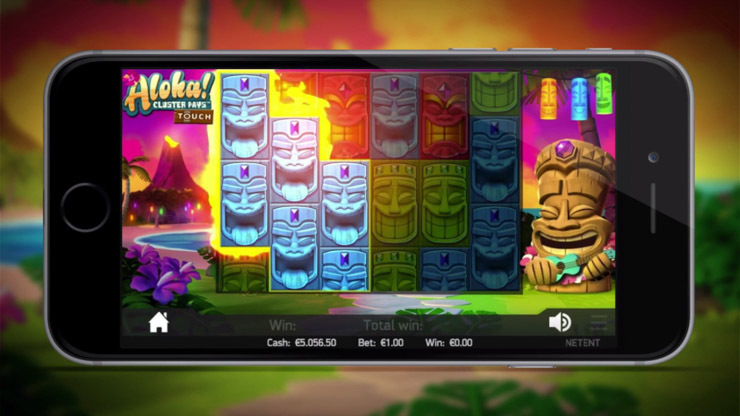 Instead, the 30-line Tiki Wonders comes with Wonder and Mega Wonder Jackpots (local jackpots). A free spins bonus and an x3 multiplier is featured on top of that. That said, here’s the 3rd top goodie the new Aloha Cluster Pays comes with. Expand your existing symbol combo for huge wins. On the paradise island it’s not only the hula girls. It’s also the opportunity to win a free re-spin thanks to the Sticky Win Re-Spins bonus. Have you played Jack Hammer or Jack Hammer 2? Then you know what it’s all about. The moment you hit a win – like the one on the screenshot – it’s locked into place. Next you get a free spin and hope that more similar symbols land on the screen. That way you expand it and form an even bigger win. An important thing to keep in mind – you don’t get paid in between each spin. Only at the end of the bonus feature. Speaking of big wins, the developers at NetEnt have done a fantastic job on the animation (see the image). And yes, there’s even more. Win a minimum of 9 free spins. How about some Hawaii post stamps? The moment you get 3 or more of such symbols on the screen you win the Free Spins bonus (minimum 9 spins). And instead of a multiplier, you get something more special. Here’s all you need to know about the Symbol Drop bonus. There are only Masks left at the end of the Free Spins. During the freebies bonus, the sun goes down and the lights go up. The mascot on the right grabs his ukulele (a small Hawaii guitar) and starts cheering you up with a song as you spin. There are some very good pays to be seen in this bonus. Here’s why. The Symbol Drop bonus means the more you spin the less low-pay symbols there are in view. 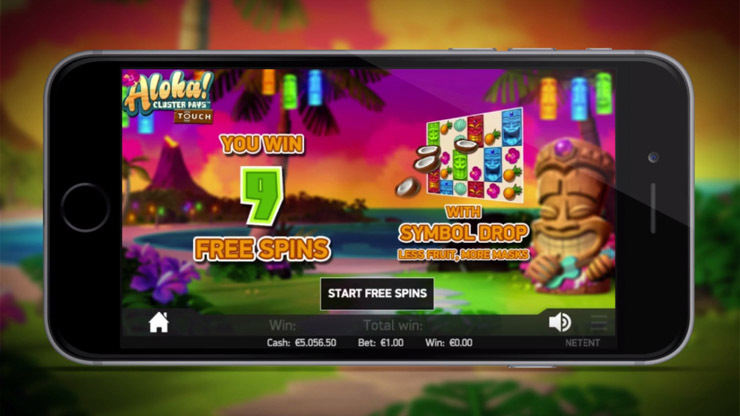 In other words, at the end of the Aloha free spins feature there won’t be any coconuts, pineapples, clams or pink flowers – only high-pay tiki statues. And you know what else it has – an Extra Spin feature. Surprise, surprise! Win more spins just like that. Not 100% sure how you get that extra spin, but there is a way to squeeze out even more free spins out of the bonus than the initial 9 or more. Maybe you get it for extra Masks. Or it can be part of some win guarantee feature, meaning you are guaranteed a win in the free spins bonus. For now I can only speculate, so let’s wait till the Aloha Cluster Pays slot release date. It gets very hot with big wins, so grab your sunglasses too. 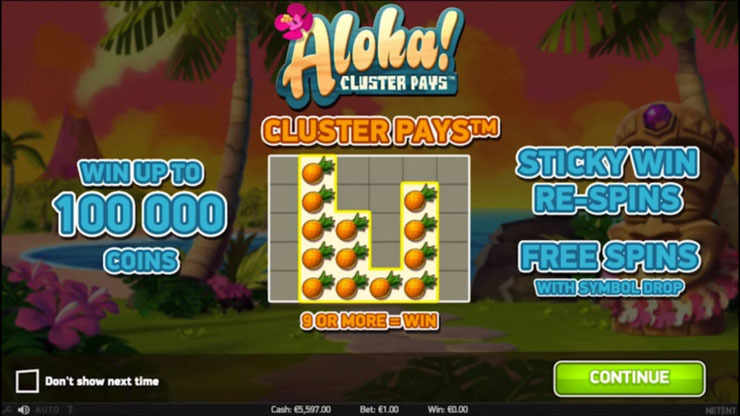 Aloha Cluster Pays is available across all platforms: Flash and HTML5. The game is already live from 22nd March 2016. 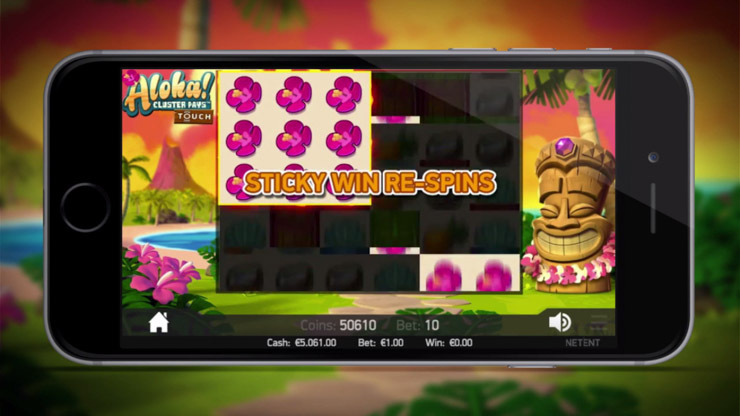 Thanks to the stacked symbols (including Wilds), sticky win re-spins, and free spins with symbol drops + extra spins – this Hawaii slot is a must-play. And don’t forget about the 100,000-coin jackpot. 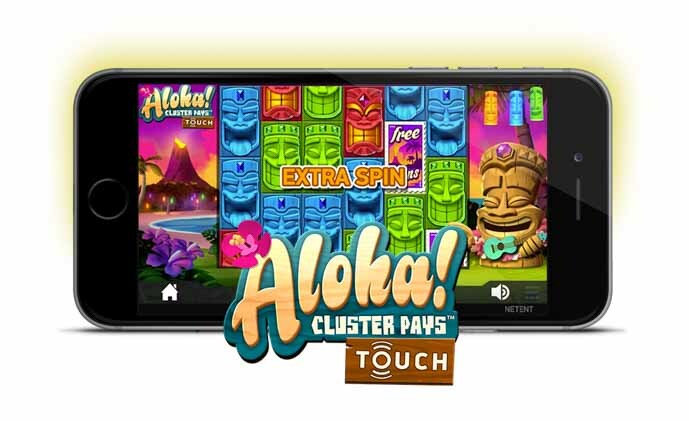 Play Aloha Cluster Pays at Rizk casino. Here’s what else was released in February 2016. Fantasini Master of Mystery was released on 11th February, and Drive Multiplier Mayhem on 23rd February. See my full reviews here and here. The most anticipated slot of the year – Guns N’ Roses – is already out too, together with the Jimi Hendrix counterpart. Join in on the fun in all of them at Rizk.